Today was a free day. We had planned some months ago to go to Cordoba since the tour was not going there, and we really wanted to see the Mosque/Cathedral. We had bought our train tickets on the internet site several weeks before we left. Our plan was to take a taxi up the hill to the train station that we visited yesterday and take the train to Malaga. An earlier desk clerk in the hotel said that that was the best way to get to Malaga. We mentioned our plans to another desk clerk later in the day and he said that train wasn’t running anymore due to construction. You would think that a staff in a large hotel like that would know about a train not running. Also yesterday the desk clerk said that if we brought our laundry in early in the morning they could get it back to us by late afternoon. When we took the laundry there was some question about us getting it back the same day. The head of the laundry was standing there and personally took it. 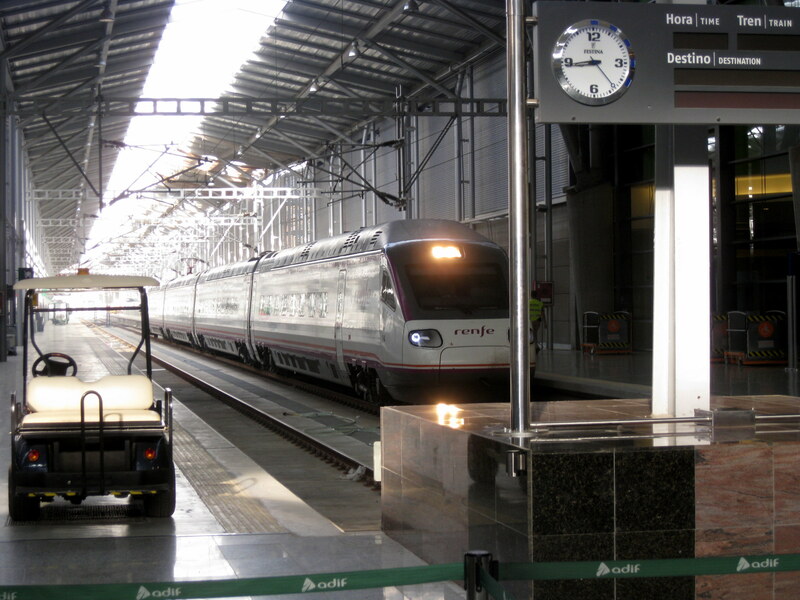 Because we couldn’t be sure of the status of the train to Malaga, we decided to take a taxi all the way to Malaga. It only took a half hour in rush hour traffic. It cost about 25 Euros. We had a little time to wait until the train left. We took the Avant train which is very fast but not as fast as the Ave train which reaches speed of 300 mph. It took about an hour to reach Cordoba. We travelled through a lot of long tunnels through the mountains. 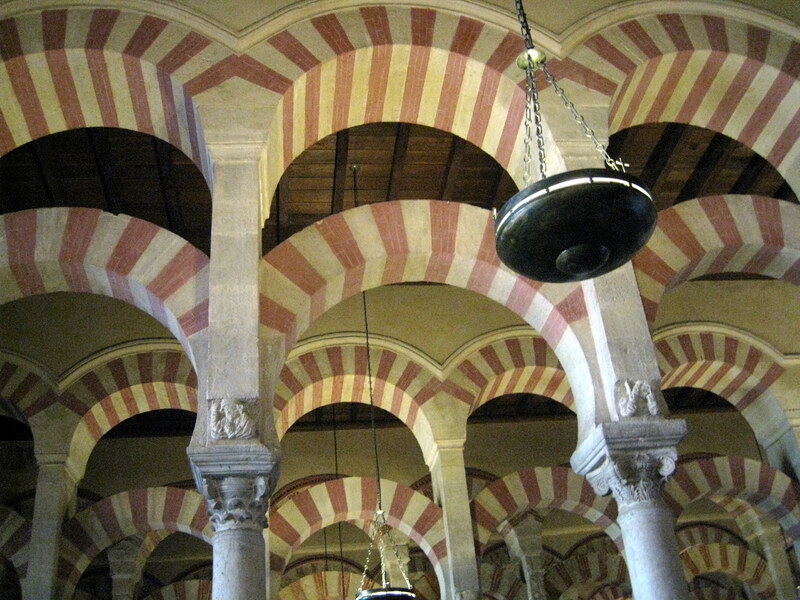 Ten centuries ago Córdoba was the capital of Muslim Spain. With a population of 900,000, it was Europe's largest city and a worldwide cultural and intellectual center. Later, hordes sacked the city, tearing down ancient buildings and carting off many art treasures. 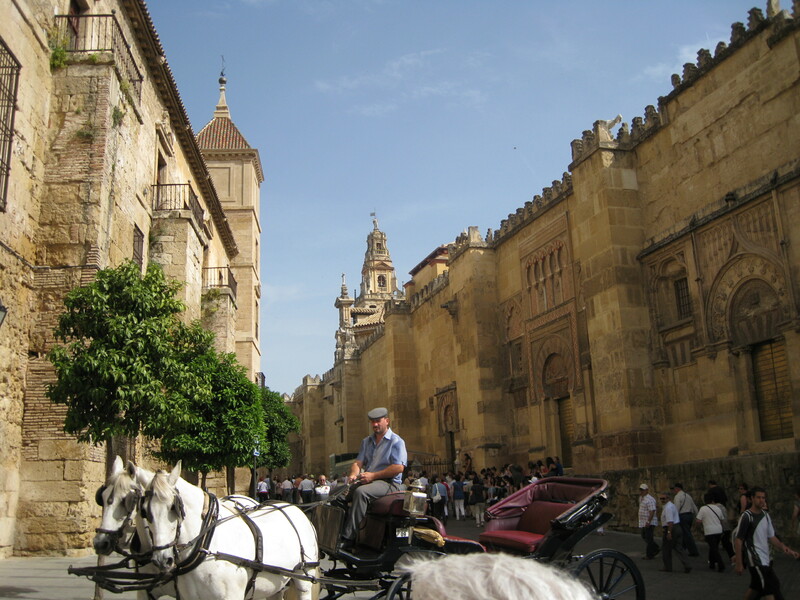 Despite these assaults, Córdoba still retains traces of its former glory -- in fact, of the three great medieval cities of Andalusia, Córdoba best preserves its Moorish legacy. Today this provincial capital is known chiefly for its mosque, the world-famous Mezquita, but it abounds with other artistic and architectural riches. From the 8th to the 11th centuries, the Umayyad caliphs brought an opulent lifestyle and great learning and culture to Córdoba while most of the rest of Europe languished in the Dark Ages. 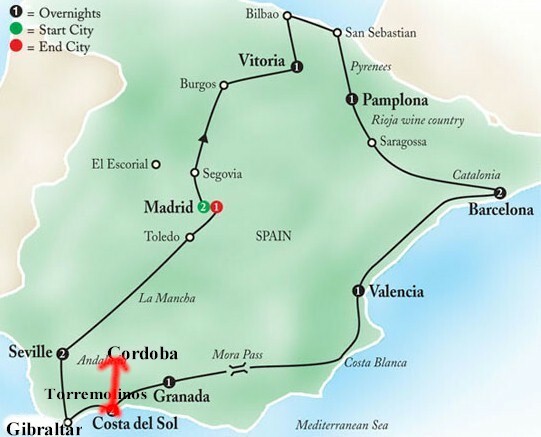 In those days, Córdoba -- not Madrid -- was the capital of Iberia. 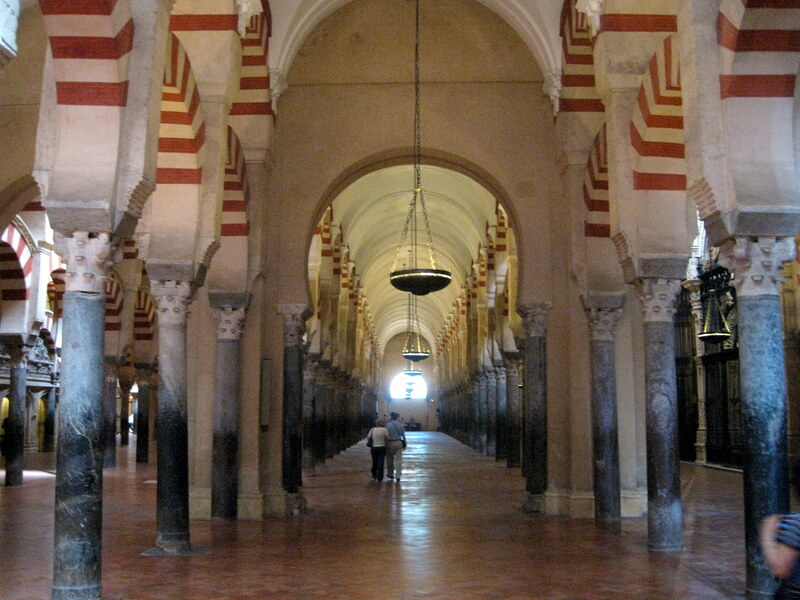 In its heyday, a pilgrimage to the Great Mezquita in Córdoba by a Muslim was said to have equaled a journey to Mecca. We took a taxi from the train station to the Mosque/Cathedral for 5 Euros. We bought our tickets and rented audio guides. The interior was unbelievable. We were certainly glad that we had read our book on Moorish Architecture before seeing this wonderful place. This was one of the highlights of our trip. We don’t know why Globus didn’t include this on their itinerary rather than Torremolinos. In discussing this later with Kaye, she said that they used to go to Cordoba but people didn’t like it and wanted to stay longer at the beach. What a pity! We were the only ones on our trip who went to Cordoba. 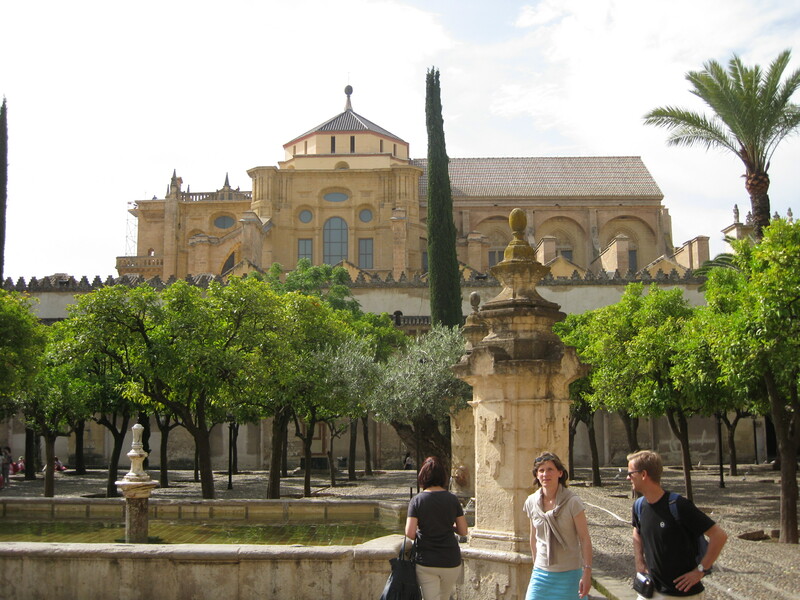 Some people had no idea about Cordoba and the Mosque/Cathedral. In the 8th century, this Mezquita (Great Mosque) became the crowning glory of Muslim architecture in the West. With its fantastic labyrinth of red-and-white candy-striped Moorish horseshoe arches, it remains one of the grandest attractions in Europe. Not even the Catholic cathedral placed in its center can destroy the impact of this "forest" of architectural pillars. 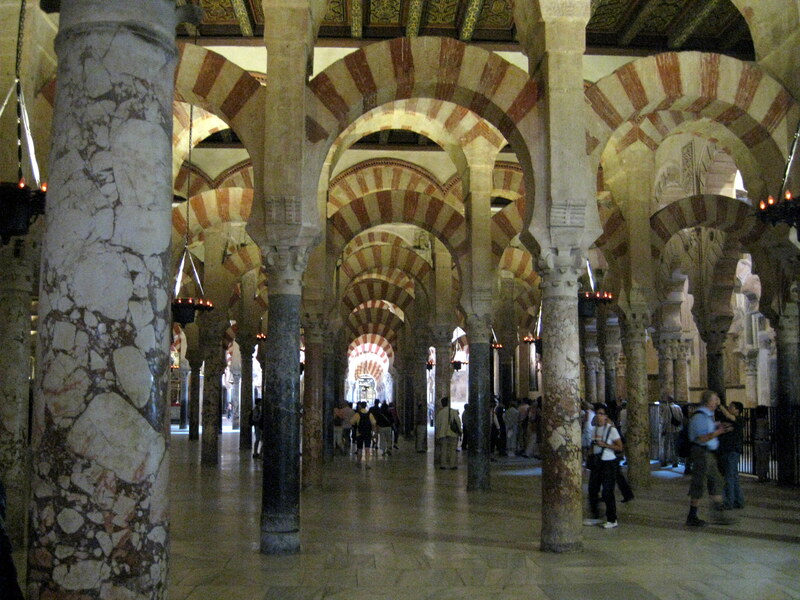 The caliph of Córdoba, Abd el-Rahman I, built this place of worship in 785. 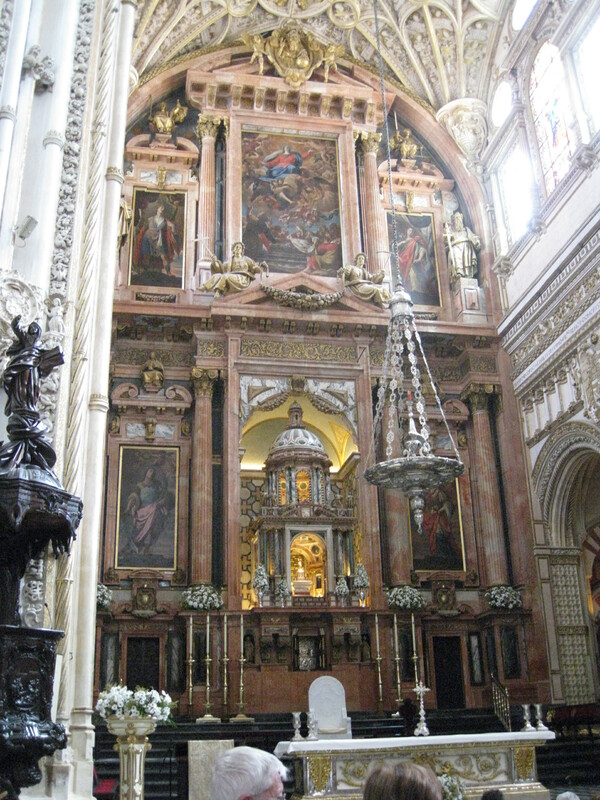 To do so, he razed an earlier Visigothic basilica, which itself had replaced a Roman temple. Initially, the Great Mosque covered 251,000 sq. ft.
Before the Catholic takeover, the mosque had a total of 900 pillars. Remarkably, 856 pillars are still standing. Their red and white peppermint stripes are formed in large part by white stone and redbrick voussoirs. The pillars are also built of onyx, granite, marble, and jasper, filling a total of 19 aisles. 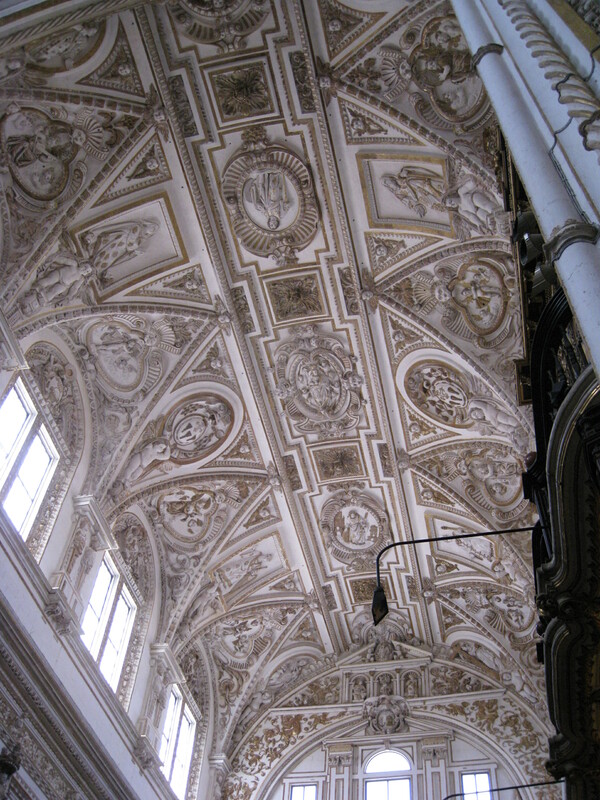 A second row of arches set above the first almost doubles the height of the ceiling. Some of the most interesting pillars came from the ancient Visigothic basilica. These had impressive carvings on their capitals. Since some of the pillars brought in were taller than others, they had to be sunk into the floor of the mosque. The oldest known pillar came from Egypt and dates from the reign of Amenophis IV. 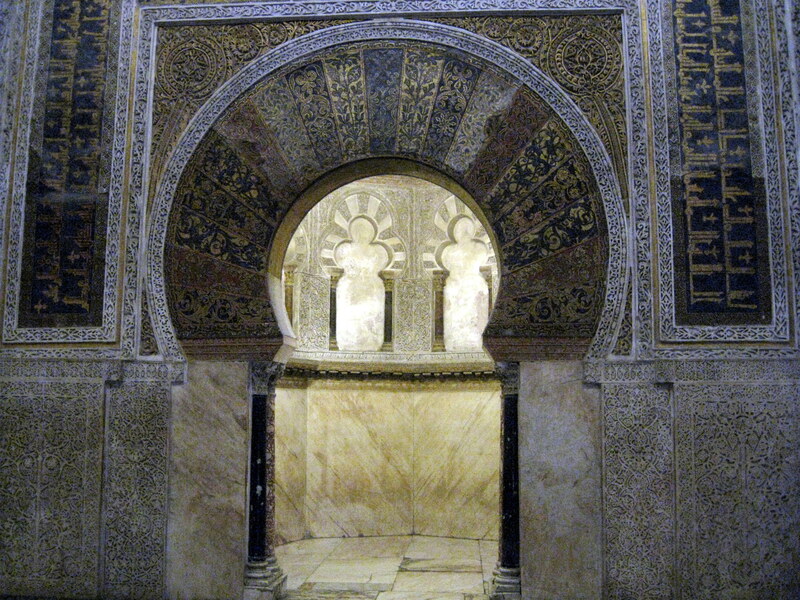 In the very heart of the Mezquita lie s the Mihrab, where the faithful gathered for ritual prayers. The Mihrab was the holy sanctuary where the Koran was kept. It was also said to have another precious treasure: a bone from the arm of the prophet Muhammad. The bejeweled Koran was copied by the caliph's own hand and anointed with his blood. This sanctum is covered by a scallop-shaped dome, which is richly decorated with beautiful colored mosaics and gilded tiles. 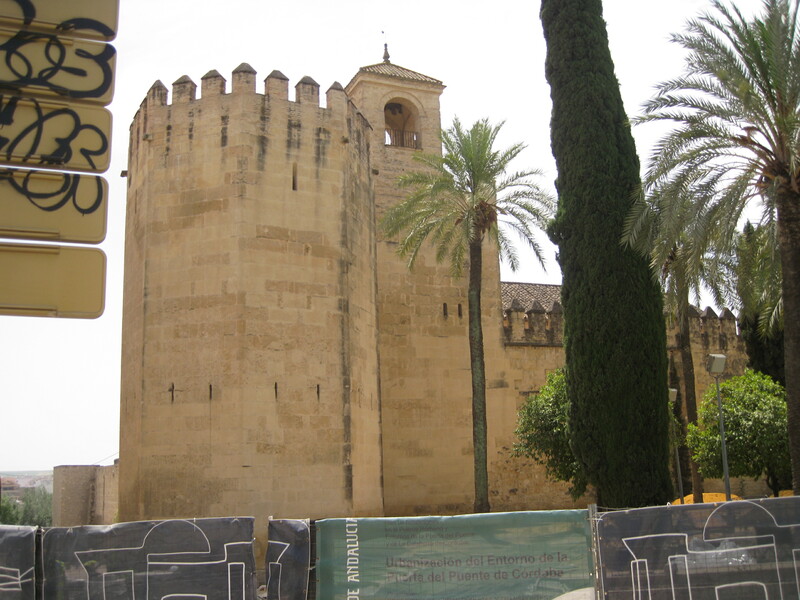 Although the people of Córdoba rallied against the idea, Emperor Carlos V ordered that part of the mosque be torn down to make way for the Catedral, which disfigured the mosque. Later he regretted his decision, saying to his architects, "What you are building here can be found anywhere, but what you have destroyed exists nowhere." Construction began in 1523 in the Gothic style, although later additions were in the Plateresque and baroque styles, and even the Renaissance shows up in decorative figures in the medallions in the apsidal vaulting in 1560. The floor plan on the left shows the development and extensions of the mosque. The yellow area (#12) was the earliest part, built in 786 by Abd-ar-Rahman I. The gold area (#13) was an extension with 80 columns by Abd-ar-Rahman II in 832. The next extension is the pink area (#14) by Al-Hakam III in 962. He added 190 large columns, 24 mid size columns and 84 small columns in the dome. This was followed by the Aisles of Almanzor in 987. This extension in the green area (#15) added 8 aisles and 356 new columns. The cathedral can be seen in the middle, built partly in the gold and green areas. The Mihrab is the small area (#23) on the right side of the pink area. 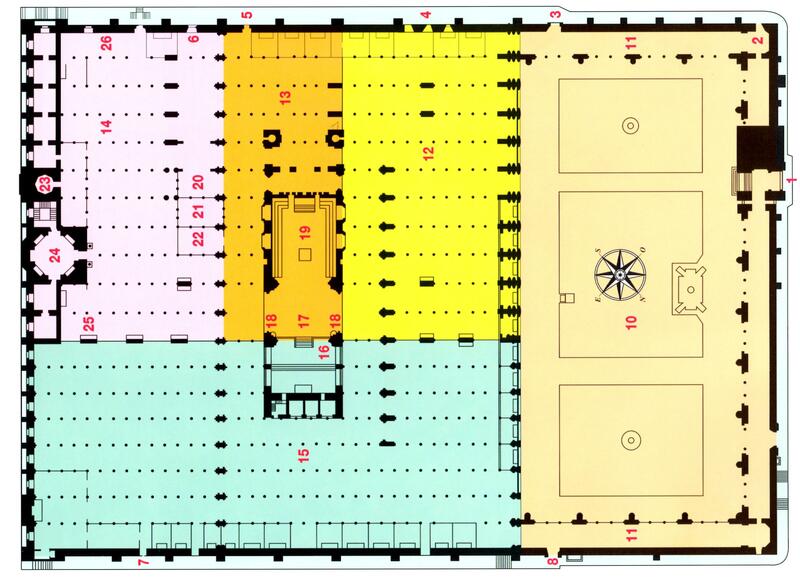 Each small dot on the floor plan represents a column. The light tan area on the right side of the plan (#10) is the Orange Tree Courtyard. We stayed in the Mosque/cathedral over two hours. We had lunch at Burger King which was just across the street from the entrance. You can’t escape the American quick hamburger joints. It did taste good. We headed off in the direction of the Roman bridge, but took a wrong street somewhere and ended some blocks from the bridge. Then we just followed the river and found it without difficulty. 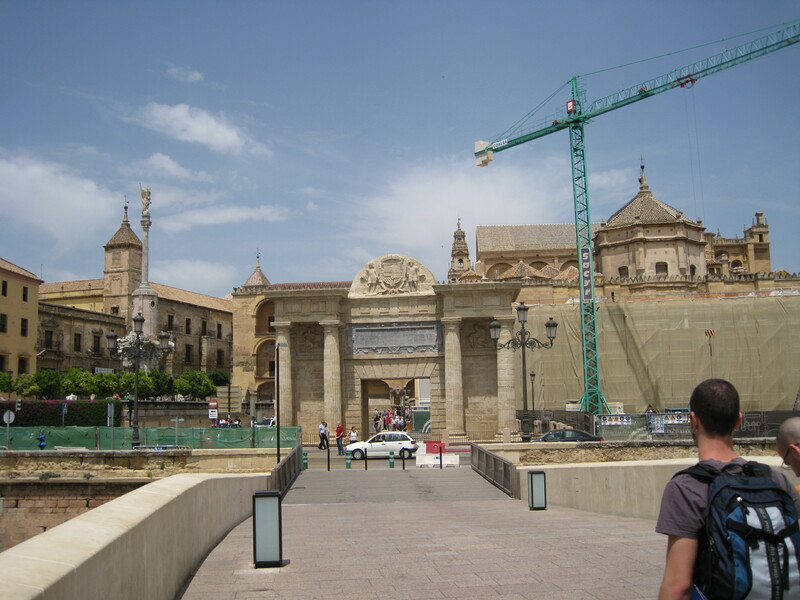 We walked down past it looking for the entrance to the Alcazar but we ran into construction. So back to the bridge, through a Roman arch and towards the Mosque/Cathedral and found the Alcazar. Our book said it was closed for siesta, but it wasn’t and they were allowing people in for free. It was very beautiful and quite interesting. Commissioned in 1328 by Alfonso XI, the Alcázar of the Christian monarchs is a fine example of military architecture. Ferdinand and Isabella governed Castile from this fortress on the Río Guadalquivir as they prepared to reconquer Granada, the last Moorish stronghold in Spain. Columbus journeyed here to tell Isabella his plans for discovery. And it was at the Alcázar that Ferdinand and Isabella bade Columbus farewell as he set out to chart unknown territory and discover a new world. The Alcázar was also the headquarters of the dreaded Spanish Inquisition for three centuries. A former Arab bathhouse in the basement was turned into a Counter-Reformation interrogation center. Originally, the Alcázar (Fortress) was the abode of the Umayyad caliphs. Of their former palace, little remains except ruins. 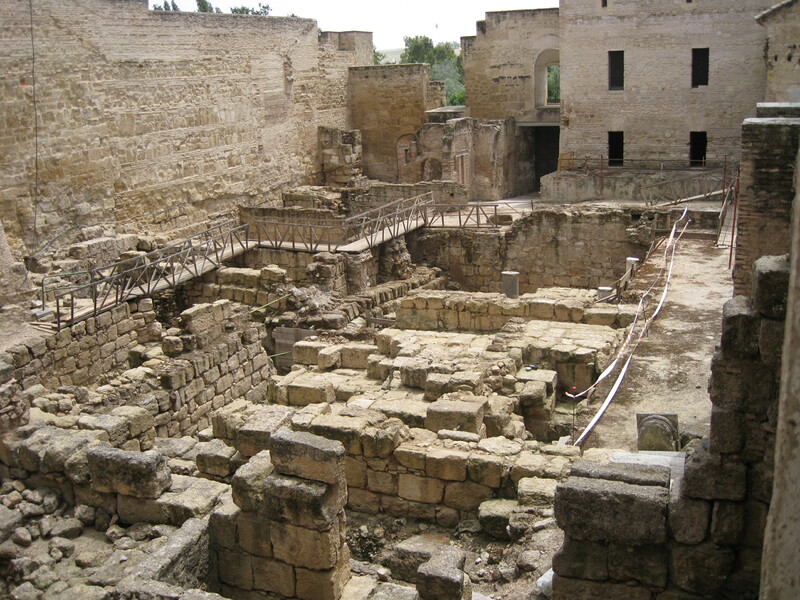 You can see some Moorish courtyards with ornamental basins and some cooling pools and baths. Also on view are some impressive Roman mosaics from the time of the Emperor Augustus. 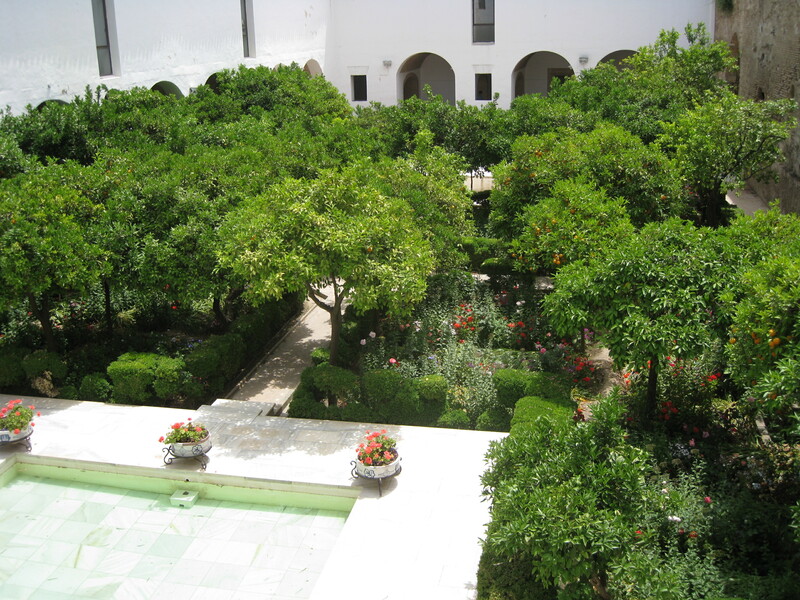 The Gardens of the Alcázar display their Arabic origins, complete with terraces, pools, and cooling fountains. There are Cypresses, towering palms and orange trees. We were hot and tired and sat in the cool and fragrant gardensThe centerpiece of the fortress, The Patio Morisco (Court of the Moors) is another lovely spot, with twin pools and an ivy-covered grotto, and pavement decorated with the coats-of-arms of León and Castile. After spending some time there, we decided to head back to the train station. We had a little wait but enjoyed a lemonade and snack in the station. On our trip to Cordoba we rode backwards. Going back to Malaga we also had assigned seat backwards, but there were seats across from us going forward. We heard some English and said hello to the couple facing us. They live in Cornwell, UK. They have a mobile home in Spain near Malaga. It was interesting to hear their stories of students that they had housed through Experiments in International Living. They had had students from Japan, Africa and a blind student from Denmark. They got off a stop before us so we changed seat and rode forward to a while. We took a taxi back to the hotel… it cost 18 euros (24 to go). We showed the taxi driver our room key with the address and he took us right to the door. Went to our room for a few minutes and then off to the pharmacy for my pills. They were ready. We went back to our room and sat on the balcony for our gin and tonic. We checked on our laundry but it wasn’t ready yet. We had planned on eating the hotel dining room, but the menu didn’t sound appealing so we went back on the boardwalk and found a nice restaurant. We shared a salad. My wife had Lasagna, and I had seafood spaghetti. When we entered the restaurant, we were asked if we wanted smoking or non smoking. I think they go by tables and not sections. As we were finishing up our dinner, the man next to us started smoking. We moved to the bar to get our check. We stopped on the boardwalk for ice cream. When we got back home our laundry was finally waiting for us.